Over lunch at 21 with Harvey Cromwell of Cromwell, Thatcher, and Waterbury (advertising agency), Lucy discusses Ricky's chances of hosting a new TV show. Ricky is reluctant when he learns that the sponsor, Phipps Department Store, prefers a husband-and-wife format. Nonetheless, Ricky agrees to do the show. 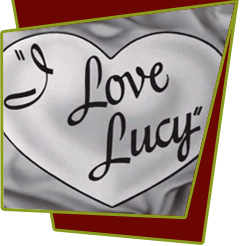 But when Lucy learns that he hadn't wanted her in the show at all, she decides to get even by sabatoging the "Breakfast with Lucy and Ricky" dress rehearsal being conducted at the Ricardo apartment. What Lucy doesn't know is that the so-called rehearsal is actually being broadcast to the entire city of New York in an effort to achieve that "unrehearsed," spontaneous look. As the show begins (Ricky: "Why, hello there … I didn't see you come in. Won't you have breakfast with us?") Lucy promptly complains of a backache from sleeping on a Phipps mattress; then comments, after savoring the Phipps-prepared breakfast, "Food always tastes different when they fix it. I don't know what they do to it." She then disappears into the bedroom only to reappear moments later in a potatoe sack - an example of what Phipps's fashion department can do for a woman. She adds insult to Ricky's injury by singing her own lyrics to the sponsor's theme song - "Phipps is a great big bunch of gyps!" Special Notes: This episode was originally scheduled for broadcast on November 1, 1954 on the full CBS network, but was pulled at the last minute because the Republican Party had purchased the half-hour to show a filmed campaign commercial. While the CBS owned and operated stations and many affiliates aired the Republican program, there were many other stations that were not part of the network and actually aired this episode as scheduled. The CBS network aired the episode for the first time on April 11, 1955, while those affiliates who aired it as scheduled were fed a rerun. Lee Millar, who played "Mr. Taylor" was the son of actress Verna Felton, who appeared on "I Love Lucy" twice in 1953. She played Lucy's maid, "Mrs. Porter" in the episode "Lucy Hires a Maid", and as the frowsy housewife to whom Lucy attempts to sell a "Handy-Dandy Vacuum Cleaner" in the episode "Sales Resistance." Bloopers: Lucy flubs a line, and tells Ricky that she met a "big agency man" who has a "show who's looking for a sponsor", requiring a post-production voiceover. In the final version, we hear Lucy saying that the agency man has a "sponsor who's looking for a show", but you can still tell her lips don't move correctly.